It’s halftime for our Telekom Fashion Fusion & Lufthansa FlyingLab Challenge! In order to get a sense of the teams’ progress, we attended the facilities of the Fab Lab and invited the jury members as well as media representatives who had the opportunity to inspect the current status quo up close. The teams were visibly nervous on Tuesday, 7th November at the Fab Lab in Berlin. 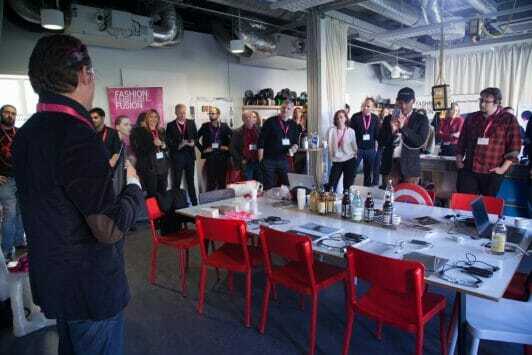 Quite understandably, since everything needed to be set up and presentable for the Telekom Fashion Fusion & Lufthansa FlyingLab jury members and selected invitees. For the first time since the finalist teams started working of their concepts, they had the possibility to present their current prototype status to an audience, sharing their progress thus far as well as obstacles they have encountered during the realization process. Team Smart Chair showed a fascinating and intricate video which visualized their idea and concept in depth. Their focus, as the name suggests, still lies on creating a plane seat that is highly intelligent on many different levels and we got to see the next stage of that prototype in terms of aesthetic and function. Similar to most public transportation, (plane) seats always seem to be lacking either comfort or design, an issue the team wants to erase durably. Their design-wise minimalistic and futuristic smart chair gets a complete update and we wouldn’t mind spending our travel time sitting in one of those. Team Lyra gave the guests the possibility to put on two versions of their smart glasses that are meant to facilitate the interaction between cabin crew staff and passengers. For example, the personnel can get insights on the passengers nationality, diet and possible health issues and react accordingly. Their digitized on-board system is supposed to provide the staff with necessary information on one hand, and passengers with a more individual, custom-tailored service on the other hand. Bottom line: an optimized, more fluid flying experience of everyone. Team Feel.Flight had set up almost like an entire exhibition of their prototype progress: detailed design sketches, used materials, innovative patterns and chosen color schemes, descriptive manuals for their on-board chat bot system (which has an adorable name that we won’t reveal yet) as well as first real designs for staff uniforms, smart blankets and slippers that are supposed to keep you moving during long flights. Overall, the jury and the guests were impressed by the development of each team’s initial idea(s) into tangible prototypes. One could clearly see that some concepts revisit and question the traditional flying experience, both for cabin crew staff and passengers, and try to bring added value to traveling up in the sky. At the end of every presentation, the jury got to comment, evaluate and give critical feedback to the teams in order to push their ideas even further and steer them in the right direction: Is your prototype user-friendly? How can it be aesthetically enhanced? Can you add a new and unique feature to your product? What are the benefits for the target group? The exchange between the jury and the teams was not at all superficial, but really tried to point out the strengths and weaknesses for each team to evolve and be prepared to take it to the next level. After all, the finalized prototypes will be unveiled on a flight from Frankfurt to CES Las Vegas in January – and what’s more satisfying than seeing something you created from scratch become reality? Exactly. Stay tuned for part II of our event review including the keynote speeches with Prof. Anne Schwarz-Pfeiffer from Hochschule Niederrhein, Ben Buescher from Red Bull/AlphaTauri and Dominik Salzer from Hugo Boss.